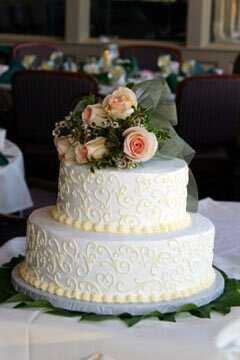 All new brides are looking for wedding cake ideas to help them decide on the perfect wedding cake design. From wedding cake shapes, the actual cake size, the cake decorations and last-but-not-least, the wedding cake flavour. 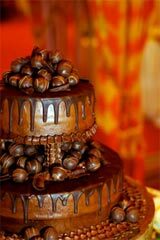 Choosing your wedding cake can be overwhelming, it's no wonder, as their are so many wedding cake designs to choose from. 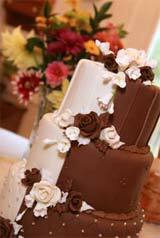 Check out our extensive wedding cake gallery. Decorating wedding cakes are very much like choosing fashion accessories, there needs to be a look or a theme for it to work. So how do you choose the perfect wedding cake design that serves as a centerpiece for your wedding and were do you get started. 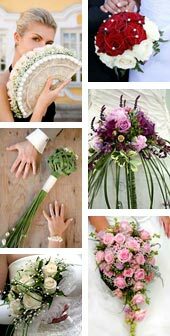 Wedding theme or colour scheme of your wedding. The style of your bridal gown, the fabric and beads, pearls or crystals used. The flowers and colours that are in the brides bouquet? Have a confirmed wedding date. 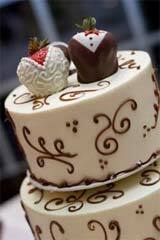 Know your wedding cake budget, how much do you want to spend? The wedding reception location, as the cake may need to be delivered. Number of guests attending the wedding reception. Will your wedding cake be served as the main dessert? Will your wedding cake be served as dessert-sized portions, finger-sized coffee portions or box as wedding favours or bomboniere for your guests to take home with them? 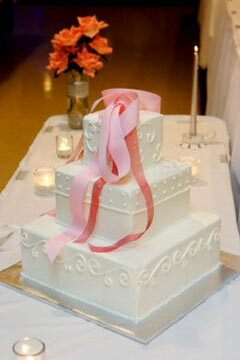 Will you want to keep the top tier of your wedding cake for the celebration of your first anniversary? Last of all, the wedding cake flavour. 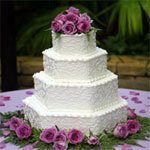 Your cake maker will offer a selection of their most popular wedding cake flavours or you may suggest your own. 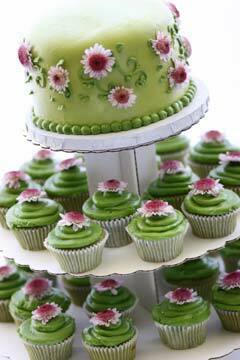 Your wedding theme or colour scheme will be carried through to the wedding cake design. 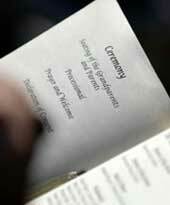 The actual wedding cake size and number of wedding cake tiers or cake layers are governed by the number of people on your guest list. 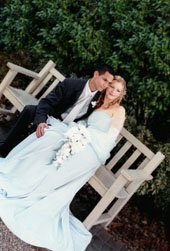 And if your wedding gown has intricate beading or lace work, it can also be carried through to the wedding cake decorating. Note: Make sure to take along fabric swatches of either your wedding gown and/or bridemaids dresses for colour matching and show examples of any beading or crystals that will be used on your wedding gown or veil. 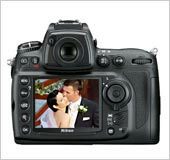 Bring along photo's or magazines of wedding cake ideas that inspire you, so the perfect wedding cake can be created and designed just for you. If you are planning a floral wedding cake, the most common wedding cake decorations are silk or fresh flowers that match perfectly with the brides bouquet. There are different wedding cake shapes to choose from. 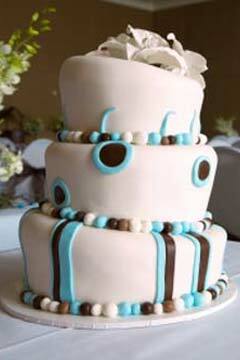 Your wedding cake can be; round, oval, square, rectangular or hexagon. 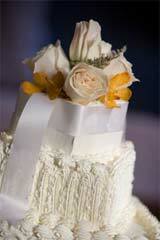 If you're on a tight budget, square wedding cakes offer more slices of cake for your money. Uncommon wedding cake baking tins like the oval shape and hexagon shapes are quite expensive to buy, so your wedding cake designer will factor in that cost. You see, your cake maker or wedding cake bakery will need to supply those shapes to cater to your tiered or layered wedding cake. So think carefully when deciding on the shape of your wedding cake. Your wedding cake designer will work within your cake budget and suggest ideas to help create the wedding cake of your dreams. Fairy Godmother tip; be specific with your goals, but also be open to new ideas. 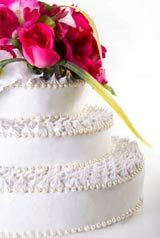 The least expensive wedding cakes are buttercream covered wedding cakes decorated with handmade silk flowers or fresh flowers. The flowers are cut to a short stem, so you may be able to get them a little cheaper as a long stem isn't needed. Also keep to flowers that are in season and locally grown, this way you don't pay importing fees to have your choosen flower flown in from interstate or overseas. 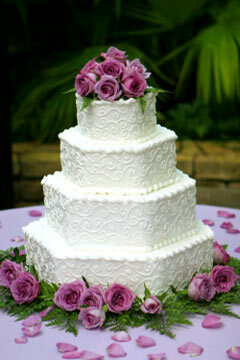 Your wedding cake bakery will offer you a selection of their most popular wedding cake flavours for you to choose from. They will also offer you a tasting, if they forget, don't forget to ask them. 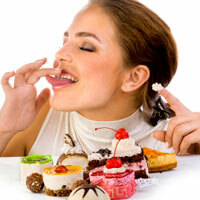 Your cake designer will be more than happy to give you a taste from their cake selection. Solid cakes like wedding fruit cake, mud cakes and carrot cake are better if your cake maker is building you a tiered wedding cake (cakes layered on top of one another). 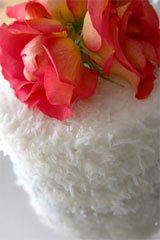 Light cakes, like sponge cake, can not take the weight of another cake on top, as it will colapse on itself. Sponge cake wedding cakes are fine if you choose to have single tiered cakes placed on platforms, sometimes known as satellite cakes. Here's a 5 STEP GUIDE to choosing your wedding cake. 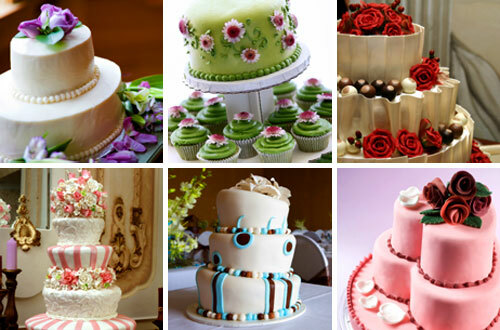 Here are some examples of the most common wedding cake shapes, designs and ideas to get you started. 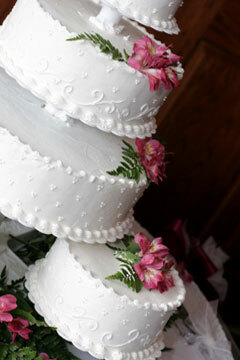 Your guest list determines the size and style of wedding cake and how many tiers you'll have. 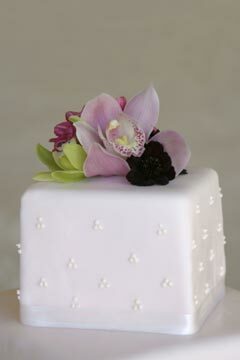 Your wedding cake can be any shape; round, oval, square, rectangular or hexagon. 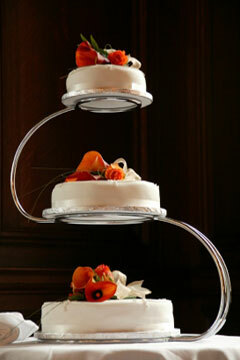 It can be a single tier, a two tier, a three tier, a four tier or a five tier wedding cake. What wedding cake frosting do you prefer? Buttercream icing, a firm smooth layer of fondant frosting, a marzipan layer, real chocolate icing, something unique? ...etc. 1. Almond flavoured marzipan or fondant frosting. 2. Fresh cream icing or buttercream frosting. 3. Buttercream icing with shredded coconut. 4. Two tone white and milk chocolate ganache icing. 5. Different coloured fondant frosting. 6. Real chocolate flavoured icing on chocolate cake. 1. 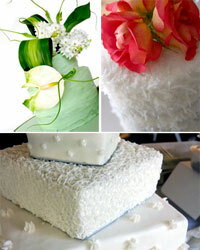 Wedding cakes with fresh flowers as toppers. 2. Creative and unique wedding cake toppers. 3. Personalized wedding cake toppers of bride & groom. The 5 Step Guide: Choosing your wedding cake. You need to already know how many people are attending your wedding before choosing your wedding cake, as this determines the size of your wedding cake and how many slices you'll get per tier size. Either choose a single tier, a two tier, a three tier, a four tier or a five tier wedding cake. It can be any shape; round, oval, square, rectangular or hexagon. 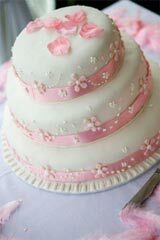 Your wedding bakery will either give you a choice of cake flavours or you may request your favourite cake. Just a quick note; sponge cake can not be tiered because it will collapse on itself. Denser cakes like fruitcake and mudcake are ideal for building tiers. If however you prefer sponge cake, separate single tier cakes can be made and be put onto different platforms so they appear like they are tiered. Will your cake be covered with buttercream icing, a firm smooth layer of fondant frosting (this choice is perfect for decorating with fresh flowers and for handmade scuptured designs), a marzipan layer or real chocolate icing etc. Having a cake topper is optional, however if you do choose to have one, the most popular are fresh flowers, bride and groom figurines, the couples initials and funny cake toppers. Decorating wedding cakes are a true art form. 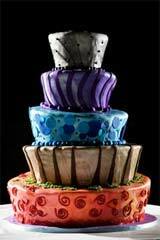 Wedding cake designers pride themselves on making the perfect WOW cake just for you. 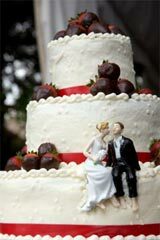 If you find any of our wedding cake pictures and ideas helpful, show your wedding cake bakery. 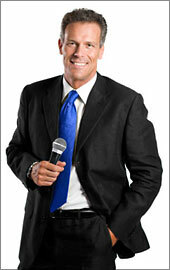 They will be able to replicate any cake photo you show them. 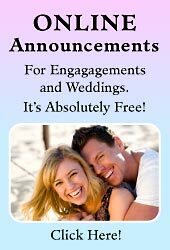 They will even come up with unique wedding cake decorating ideas to enhance your dream wedding cake.